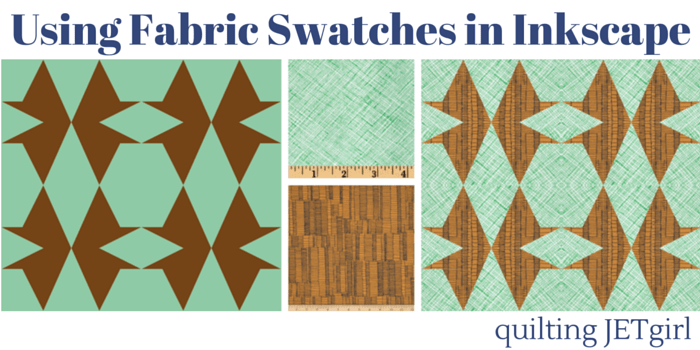 One of the things I have wanted to learn how to do within Inkscape is how to import fabric swatches and use the fabric swatches in my designs. This is something that is definitely a huge plus for the Electric Quilt design software, and I was hoping I could figure out a way to use the free Inkscape software package to do the same. I did not know if it was possible, and the best I had previously done was use the eyedropper tool to fill in the designs with solid colors from fabrics, as seen on the left in the image above. I recently had need to see how fabric would read in a design, so I set out to see if it was possible within Inkscape. As you can see on the right in the image above, I think I figured it out! I have made a short video tutorial describing the actions necessary and how to manipulate the pattern size and scale within Inkscape. I hope the video helps expand understanding and use of this powerful, free software. Is there anything else you would like to see how to do within Inkscape? Will be watching your video. When it comes to technical things I’m lost in the first few words ! Awesome video, Yvonne! I just need some time to sit down with Inkscape and play. . . I have EQ7 and have only ever used the fabrics that are available in the preloaded libraries. . . because I haven’t taken the time to learn how to do it. . . this seems so straight forward! Perfect timing for this tutorial! I was looking into the same thing just today! Thanks for the tips!! Thanks for this Yvonne: I hadn’t even heard of inkspace before . It’s great to have another tool. Hi Yvonne. So would you say Inkscape is just as good or better than EQ7? I was thinking of purchasing EQ7. Need your opinion. You are never knowingly defeated, I definitely don’t have the technical expertise to even begin to attempt that! Thanks for doing another post on Inkscape. One of these days I must try it. The same day I try Pattern Jam…the same day I figure out how to do diagrams in Word and put them in my already written pattern…as you can see computer time is not high on my priorities and I need to make time for this kind of learning. The sewing and quilting machines usually win out! This looks like fun! I have EQ 7 but don’t use it as much as I though I would! I do like Inkscape and love thats it portable between machines! Even as a non user of these tools, that sounds like a very helpful breakthrough. And I like your design up there, makes me think of birds pecking! Super helpful, Yvonne! Been meaning to watch this for awhile and today was the day!